Front cover illustration: based on a B & W photographic portrait of poet Emily Dickinson. Created by William C. North, between 10 December, 1846 and late March 1847. Published on 28 May, 1932, in Letters of Emily Dickinson (new edition by Mabel Loomis Todd). The original daguerreotype is held by the Archives & Special Collections at Amherst College. Spunti e Ricerche. 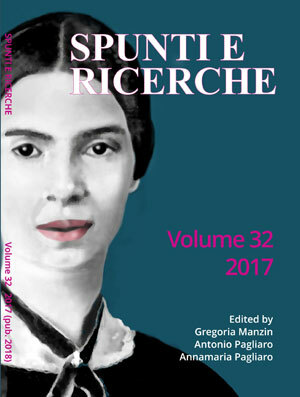 Rivista d'italianistica.